Frock Box was created for you. Women of every age, shape and size . We recognize that dressing your best, helps you feel your best and that's what it's all about. Whether you're a mom who can't seem to catch a minute for yourself. Or someone who can't stand the chaos of the mall. Maybe you just can't keep up with the trends or find something cute in your size... we're here. You'll be paired with a personal stylist who will help select items just for you every month that will be delivered right to your door. It is our goal to help style women across Canada while supporting local businesses. We are proud to promote, sell and purchase from numerous handmade Jewelry & Accessory vendors across the country. We are always looking for innovative partners and opportunities to deliver excellence in service and on-trend clothing to our subscribers. While our team and products have grown, we still read your comments, listen to your struggles and relish in the 'I feel like its Christmas every month' comments we often receive. We are working toward bettering our services to effectively serve our subscribers and to ensure value. Meet the Frock Box owner, Jenna Hill. She has a very trendy fashion style and a great eye for the latest styles, incorporating them into Frock Box. In addition to a love for fashion, Jenna cannot live without her daily Starbucks….iced venti chai anyone?! Jenna is an entrepreneur at heart, creative, energetic and one of those people you just want to be around. Aside for her love of Starbucks, spring rolls and Frock Box, she’s also a mom of two girls and married to a wonderful husband. When she’s not Frock Boxing, you might find her working her magic behind the camera as a photographer and graphic designer. If you need an event planned, opinions on your fashion choice, or just some advice, Shanlyn is definitely your gal. She is one of the founding members of Frock Box, using her Communications and Public Relations background to help grow the company to where it is today. You’ll most likely see her sporting a look with boho flare with a determined gleam in her eye and chalked full of enthusiasm. She has two adorable kids, and loves to travel and shop when she has a moment to spare. Every once in a while, Shanlyn will indulge us with some Maritime music from her hometown, which is always good for a laugh. Linda is an incredible mom of three, one girl and two boys and she can speak two languages growing up in a Portuguese speaking household. Linda is a lot obsessed with organizing things and seeking out yummy Pinterest recipes. Her style is classic, casual and timeless all matching her graceful personality. Since working for Frock Box, Linda has started to stretch out of her style comfort zone! She keeps everything rocking and rolling at Frock Box and her list of roles is extensive. She is our calm voice of reason. She also brings in the most delicious baked treats for all the staff to enjoy! Not only is Amanda a stylist extraordinaire, but she’s also very musical and has performed all over Canada! Amanda’s a familiar face on our Facebook Lives and has a lot of great tips for style with various body shapes and at 5’11, she’s all about embracing your height. Wear those heels ladies! She has a passion to empower women so they can see their fullest potential and fashion is definitely part of that! Ashley has an edgy sense of style and you can tell that she really loves connecting with our subscriber’s everyday by the thought she puts into curating boxes. Ashley is also a wife to a wonderful man, mother to her daughter and a bonus mom to two boys. She has a weakness for chocolate chip cookies and shoes! She lives with the mantra that although something may not be your style, try it on anyways – you might be surprised! Denise enjoys long walks on the beach and wine! She is a happy-go-lucky mama of two and is currently learning how to play the cello. She loves mountain biking but not jogging. Denise is also the go to person for tricks on removing marks and stains from clothing! In fact, if we ever run into a “snag” we know Denise will be able to fix it! Denise always looks incredibly put together and accessorized. Her favourite beauty accessory is Kevin Aucoin Eyelash Curler. Dora has a great sense of style and can rock mustard yellow like no one else. She's been with Frock Box since just about the beginning and is known among the staff for her warm personality and infectious smile. When she's not Frock Box-ing, she's also a part-time teacher and mama to two boys and very involved in our community. If you’re ever in town and book a private party with us, you’ll likely meet Dora as she’s one of our main party hosts. Erin tells it like it is and we love her for it, especially her sarcastic humour! If we ever need an honest opinion on a piece of clothing, we know Erin will give it to us straight – the good and the not so good! Erin has a blended family including an adopted daughter. This busy mom’s kids are 28, 23, 19 & 16. Erin’s style could be described as modern and uncluttered with a touch of subtle elegance. Her favourite clothing item is her denim jacket – few things are as classic and versatile. Kalla grew up on a farm in Saskatchewan and loves cooking, with her fave foods being sushi and pizza. She has three kids, the oldest being twins. When it comes to style, Kalla’s favourite item of clothing is a basic tee and while she’s pretty laid back and casual, she does like to dress it up. Not only is Kalla a stylist but she’s also an incredibly talented photographer. Kalla loves today’s style because anything goes, making it easier to be yourself and own it. Her infectious smile will brighten your day! Karolyn is known for her creativity and her keen eye for finding unique vintage pieces. Karolyn’s style can be best described as the girl next door with a focus on simplicity, cuteness and a little vintage flair added for good measure. Karolyn’s style is classic and timeless and her nod to retro style will always be in fashion. Next time you’re in the boutique, make sure to check out our giant chalk board sign – there’s a really good chance you’ll see some of Karolyn’s artistry at work. Fashion has been a passion of Kaylee’s since she was a little girl often changing her outfit multiple times a day! She has two young sons who keep her very busy. Her guilty pleasure is celebrity gossip and YouTube tutorials – she always has the best fashion tricks to share. Kaylee’s favourite style component is accessories! As a stylist, one of her favourite things she’s learned is that size does not dictate what type of clothing you should wear. Sarah and her husband have been friends since we were in elementary school and are now raising their three kids in their hometown (how adorable!). Sarah’s guilty pleasure is candy, never turning down a sugary treat. She would describe her style as casual/classic. A good pair of jeans or a classic black skirt is a great base for the perfect outfit. Sarah is often behind our social media presence so be sure to give her a shout out from time to time! Frock Box was born where all good ideas come from, lack of sleep and coffee - right? Three Moms, from St.Albert, Alberta who connected over coffee, kids and fashion. 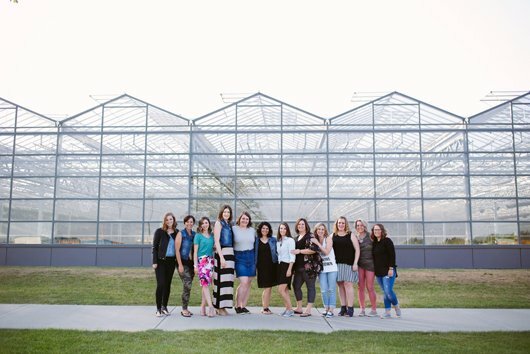 We recognized a missing segment in the Canadian marketplace and wanted to bring something unique, affordable and creative to women every single month. It began in June 2015 when we sat down to discuss fashion and business. After just having babies, we realized that dressing a post-baby body was tough and getting out to the mall was out of the question. You know that feeling when you find the perfect outfit, get your hair done and feel like you can take on the world? Well, we wanted to deliver that, to your doorstep. And so, Frock Box was born. On August 4, 2015 we launched with one box, Frock Box Gold. Our goal was to provide affordable personal styling, on-trend clothing and a brand new shopping experience. Suddenly, the numbers climbed and Canadian bloggers started talking about us. CTV News featured us on small business week and the rest was well, history?